In the Blogging A to Z Challenge there are letters that are easy to write about. On Snapshot Saturday hosted by Alyce at At Home With Books it’s easy sometimes to come up with the photos I want to use. I’m combining the two today and I will be brief. For those of you that were reading BCDC last year, R for Ralph might seem like a rerun. Well, I suppose it is. But, Ralph is first in line in all things for me. That’s why he IS the snapshot today. The photo is one of my favorites. 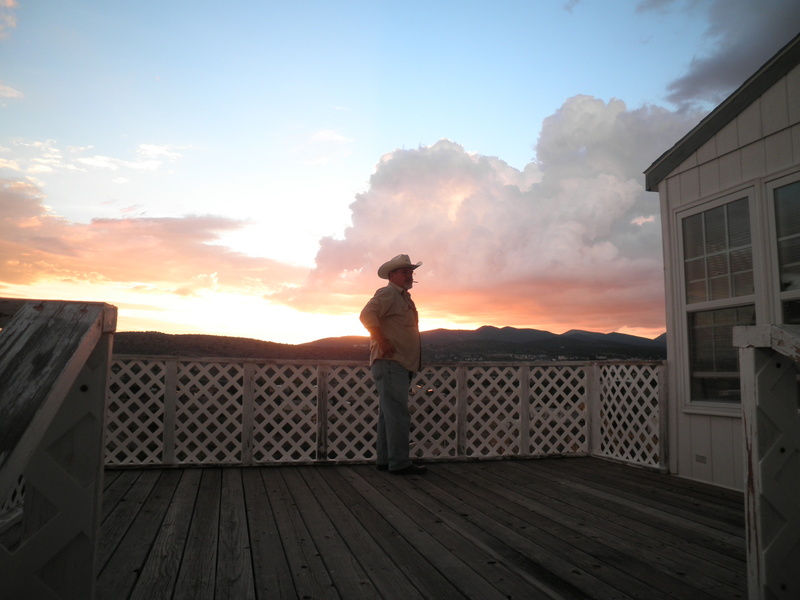 Ralph standing on the deck of our home in New Mexico, with the sunset behind him. Possibly one of the best photos I’ve ever taken. This entry was posted in Uncategorized and tagged Blogging A to Z, Snapshot Saturday. Bookmark the permalink. that photo is a winner, fran, both in subject and composition. so glad you and ralph found each other! Thanks, Cathy!. Now we just have to get there…heavy sigh~ Have a great weekend! He looks so great, almost in shadow, against that gorgeous sky. It could be a book cover! Thanks for sharing…and for visiting my blog. I’m new to your blog so don’t know the history with Ralph but it sounds like he is a special person. This is a great photo with the beautiful sky behind him. Thanks for visiting, Red Lady! He is a special guy, we’ve been together over 20 years, married for almost 13. Glad you like the photo. Please stop by again! We would like nothing better than for you and Bill to visit once we’re there, Judy. Glad you like the photo. It’s possibly my favorite ever. Hugs!! That sky is gorgeous! And I love the way he’s silhouetted in front of it. Well done! Thanks, Melonie! Glad you like it. It’s one of my favorites! That is an amazing photo with the sunlight and silhouette! Thanks, Alyce, I love it too! Thanks, Christine! I was lucky and the sunset cooperated. Wonderful photo! It does capture something intangible. Thanks, Suko, glad you like it! The lighting in that photo is amazing — it becomes more impressive as you look at it! I can easily understand why this is one of your favorite pictures. Here is my SATURDAY SNAPSHOT post. Thanks, Melissa. I actually have a series of them taken within a few minutes. At first, they all look alike but as you study them. The sky changes. That’s why I love sunrises and sunsets so much. I like R too. He looks very “R”egal up there with the clouds. Thanks, Irene. I’ll tell him you think he looks regal. He’ll like that! What a beautiful photo! I love the colors of the sky and the mountains in the background. That deck looks like a great place to spend some time, just looking at the view or reading a good book! Thanks, Vicki! Funny thing is that I go out there with a book to read, but the view is so distracting, I have a hard time. I suppose once we’re there full time, it might wear off…but I don’t think so! That is a gorgeous photo. No wonder you want to live there! Good luck in the final stretch of the A to Z! Thanks, Christine! Glad you like it and yes, the view is what convinced my husband we needed to live there. Can’t wait till it actually happens. Good luck to you on the final stretch of the A to Z. We’re all in this together which is the good part! Thanks for stopping by! Gorgeous sunset! He looks happy there. Thanks, Kathy! Yes…he IS happy there. Now we just have to get there for real! That’s a neat photo! Thanks for sharing it! Thanks for visiting, M.J.! Glad you liked my photo! I love it! Go Ralph. Getting his own letter, and that sunset is amazing. It’s a great photo Fran, and I bet you can’t wait to get there. Thanks, Meghan…you’re right…I can’t wait to get there. We get incredible sunsets almost every night out there. I’ll be really boring with the sunrises and sunsets once we get out there! Ralph deserves his own letter. That sunset just lights up the silhouette. Very nice. Thanks, Leslie, I’m glad you like it! Thanks, Eleanor! It’s one of my favorite photos and yes we are lucky. I try not to forget that!